/Maxwell & Williams says you CAN make friends with salad! Maxwell & Williams says you CAN make friends with salad! Win over family and friends with an unlikely ally – salad! Maxwell & Williams Dutch carrot and lentil recipe takes the ‘sad’ out of salad and is the perfect way to build in more greens (and oranges and yellows) to your week. 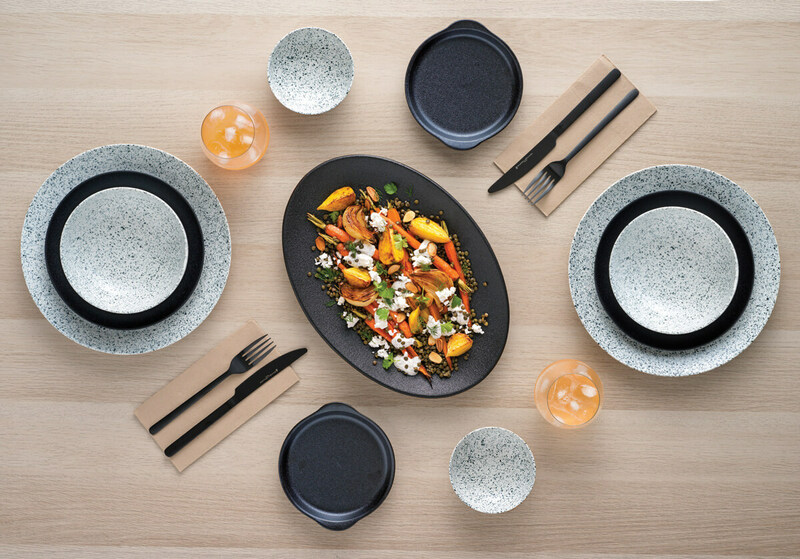 Served on Maxwell & Williams’ textural Caviar Speckle dinnerware and matte black Caviar Black range, both inspired by Australia’s contemporary café culture. Place the lentils in a medium saucepan, cover with 10cm of water and add the onion and bay leaf. Place over high heat, bring to a boil, then reduce the heat down to low and simmer until the lentils and tender but still hold their shape, this will take approximately 20-30 minutes. Add 1 teaspoon of salt toward the end of the cooking time, and more water if needed. Drain the lentils and discard the bay leaf, while still retaining the onion. Meanwhile, toss beets and carrots with 2 tablespoons of olive oil and ½ teaspoon each of salt and pepper. Roast the vegetables in the oven for approximately 25-30 minutes, or until golden brown and tender. Toss them halfway through cooking and then add the cooked onion at the halfway point. In a small Caviar Speckle matte-glazed bowl, whisk together yogurt, garlic, lemon juice, chopped parsley and dill, ¼ teaspoon salt, and the remaining tablespoon of olive oil. When ready to serve, toss the lentils with a drizzle of olive oil, a good squeeze of lemon, and salt and pepper to taste. Place the lentils on your favourite Caviar Speckle plate and top with the roasted vegetables, feta, extra herbs and almonds. Drizzle with yoghurt sauce.